Have you skin clean, dry, and free of lotions, oils, or fragrances. This ensures the area takes the henna stain as well as it can. The hands and feet stain the best with henna. Please arrive on time. However we understand that life happens. If you are going to be more than 5 minutes late to your appointment, please call or text us ahead of time to let us know (734) 536-1705 . If you fail to show up for your appointment without a call to cancel, you will not be able to make future appointments at the studio. Currently, we are cash only at the studio. You are welcome to bring in your own design ideas from online or choose from one of our own. Prices vary based on design and intricacy. This list just gives a basic idea. The time varies depending on the design, but usually application takes 15-30 minutes and then an additional 15 minutes to dry. Keep in mind, ideally you will have to keep the area and dried paste UNCOVERED for 2 hours after your henna is applied. Wear an appropriate shirt, tank top, shorts, or shoes so that makes sense for your design you’re having done. 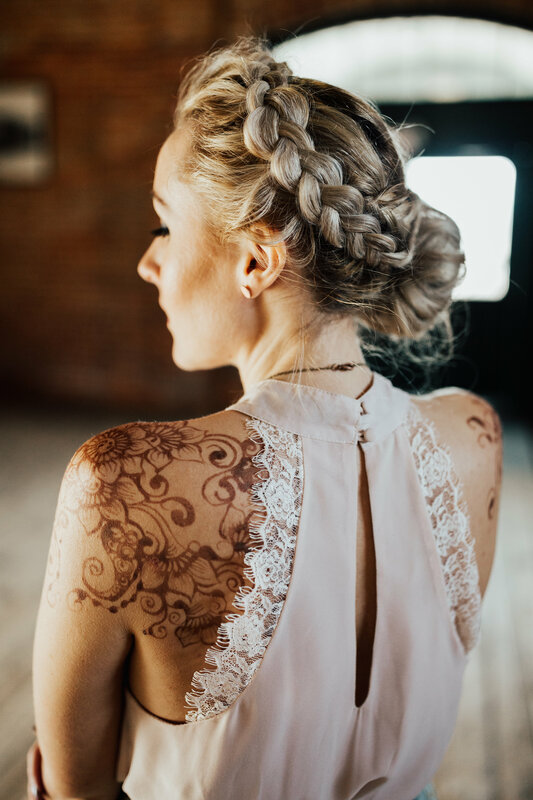 If you have henna applied where you cannot keep it uncovered, we will wait until your henna has dried completely and cover it. If you bring a friend to your appointment and they get a design that is $35 or more, you get $5 off your design. If their design is $45 or more, you get $10 off your design.